How to split a partition with MiniTool Partition Wizard Home Edition? I have an old external hard drive but that one doesn’t accept files bigger than Four GB. That is very inconvenient if you want to copy, for instance, a Blu-ray movie. At the same time, my hard drive is half full and I don’t want to loose any data or spend a lot of time on back-up. The solution is to split the partition in two and to make the other partition with NTFS file system. This is how you do it in just a few steps with the free software MiniTool Partition Wizard Home Edition. 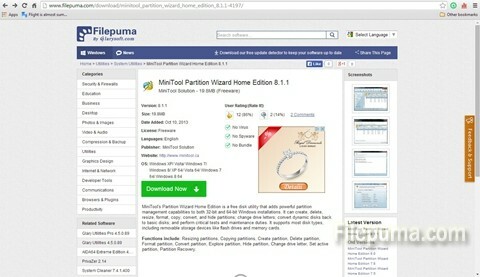 Step One: Download the free software by clicking on the green “Download Now” button on the Filepuma.com site. 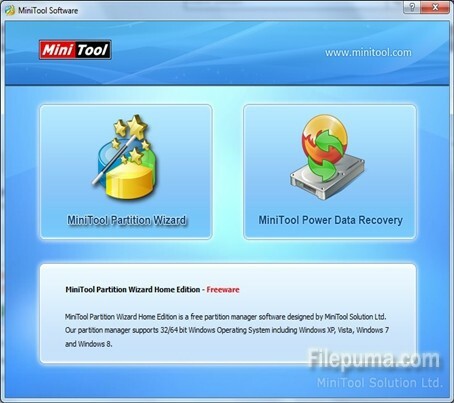 Step Two: After installation, select the MiniTool Partition Wizard. Step Three: Select the drive/partition that you need to split and click on the “Split Partition” option from the menu on the left. A new window will pop up and you will see exactly how much free space you have on that partition. In the “New Partition Size field” you can select a precise amount of space. After you click OK, you will see that the software already allocated the new partition. Step Four: Click on the “Apply” button on the upper left of the main window. The app will ask you for the name of the new partition, the file system (in my case, NTFS) and the cluster size. Don’t mess with that value if you don’t know what you’re doing. The default will be just fine. The hard part comes only AFTER you click OK because you will have to wait. The waiting time depends on the size of the drive and partition.